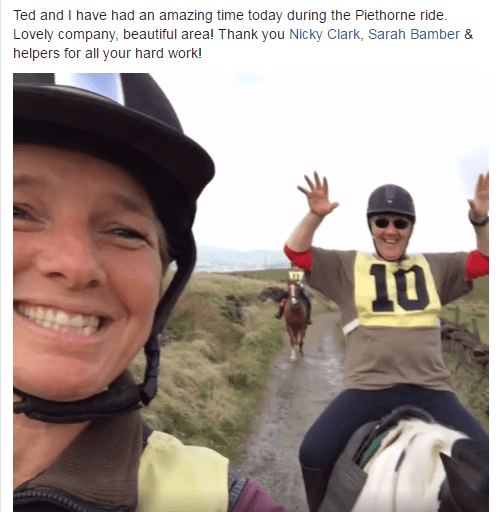 Ride Reports | Lancashire Group Of Endurance GB. Well storm Brian tried to ruin our day but as the winds were forecast to drop by Sunday 22nd October, we decided to go ahead as planned. Unfortunately, due to the rain the previous night Jamie had to re-mark the whole route before the riders went out, much to the disgust of my washer later! We had a change of route which was close to the river which was running too fast to be safe, but we opened up a new section so as the riders still could ride 24kms and received some really good feedback. I must thank the forestry commission for allowing this change at such short notice. We had a few dropouts but that was to be expected, riders came from Cumbria, Derbyshire and West Yorkshire plus a good local contingent. The volunteers for the checkpoints donned their waterproofs and off they set. Indie Pics (Ruth Saunders) was our photographer for the day and the ever so famous Ted the bull terrier donned his all-weather gear to get some cracking shots of the riders on the return to the venue. Surprisingly most horses came back very clean, even though the crossing from Outwood to Phillips Park was quite muddy. A great day was had by all, with the exception of Duncan McCartney who was trod on by Tilly, Duncan now has an early Xmas present of steel toe cap boots. Thanks to all my volunteers, Markers - Jamie Houghton, Diane Hudson, Helen Dawson, Checkpoints - Kath Wilson, Angela Leadbetter and Jane Rothwell, Timekeepers: Justin and Alice Bamber, First Aid – Liz Nabb and Office – Sarah Bamber; who without their help these rides cannot go ahead. The week before the ride proved to be very busy with people trying to get a place on what is proving to be a very popular ride on the calendar. Maxine Braithwaite did a fantastic job of taking paper entries and keeping everyone up to date with what was happening on Face-book while Cath and I coordinated the online entries. I have to say this proved challenging at times but Cath proved to be very patient! This year I decided to alter the route for the longer ride taking in an extra bridleway and stream crossing, but the short route remained the same as last year. The forecast wasn’t too bad...at least no rain or wind, and 61 riders set off from the venue Barton Equestrian Centre helped across the motorway bridges by stewards when needed, to do either a 16 km or 26 km route. The stream crossing just after the duck farm had eroded very badly at one side and we had a large hole, so I got in touch with Lancashire County Council 2 months ago to explain our predicament of sending 60 riders along a route with a hole under the water.....the fantastic result was that they renewed that side of the crossing with large stones which were cemented in and cleared away a large overhanging branch off a tree, making it all much safer...a big thank you to Stephen Williams (LCC) for his support. The farmer at the dairy farm had put 2 large logs across one bridleway to stop motorbikes but had left a gap in the middle. When we saw him the week before and explained a ride was coming through he said he would move them...even though there was lots of room...so nice when people are helpful! The marking proved to be spot on despite heavy rain two hours after Linda Earnshaw and I had done it, with only a couple of riders getting slightly lost as they missed the two arrows at the Duck farm but after phoning us at the venue they were soon back on track! Edwin Devey’s photos are fabulous......look on his website whatapicture.biz to find yours...please support Edwin by buying a photo! The last bridleway back to the venue got a bit deep and muddy but when you consider 120+ horses had used it that day it held up reasonably well and was certainly a better option than using a busy road. This year we had even less gates for riders to open due to Angela and Val who trekked along a BW to help at two narrow gates. Sadly, Judy Ainley had an accident when her horse tripped and fell on her way back to the venue but hopefully Ellie is on the road to recovery and her knees will soon be mended. This ride report cannot be complete without me thanking all the lovely people who gave up their day to help...a long list of helpers but in particular, Kirstie was a godsend at the secretary’s desk and I hope she will volunteer again! Many thanks go to all these helpers on and before the day; without them giving up their time we wouldn’t be able to put a ride on at all and also to Barton equestrian for letting us take over their car park and supplying scrummy refreshments on the day. It’s lovely when people say thank you as we do our best to put on a good ride and help our riders have a fun day! Hope to see you all again next year when Becky Paul will be the ride organiser. It would be nice to have some new rides on our calendar and if you want any help in planning a ride and route, I am sure the committee would be ready, willing and able to do so! 8.15am saw me & Hilary (my long suffering friend who helps out every year!) setting up for the Waterside Ride as the first trailer arrived. Windy as usual but not raining...YET! 47 riders turned up and so did the rain but not as bad as previous years. We had a lot of new faces, including 2 retrained racehorses from Jack Berry Racing Stables at Cockerham who were very well behaved and their riders thoroughly enjoyed the route and are thinking of becoming members next year. No one got lost this year but 2 riders exited the beach too early then realised their mistake! Thank you to Cath Houghton for First Aider duties (thankfully not needed) and to all road stewards who did a great job, also Janet and Judith Danson- Smith from Church who were timekeepers, they really enjoy watching all the horses, picking out the Best Turned Out and also donating butties and cakes. Anona from Fylde Coast Bridleways brought her 8 yr old granddaughter to help checkpoint on the beach and she was meticulous writing down times and checking rider number bibs through her binoculars. Commiserations to those riders who had to cancel due to problems with their horses and to Glenda Griffin whose horse had to be picked up on the beach after going lame! I've never towed with an automatic vehicle before! Thank you to all who supported the ride and the Tombola, we are glad everyone enjoyed the refreshments. Thanks- Angela Leadbetter, ride organiser. Every Tuesday Jean Merchant and I try to get out for a walk and while looking through my maps for somewhere different to go I came across a very old leaflet for the Medlock Valley Way, this route was aimed at horse riders so we decided to start walking a bit of it at a time to see if it was still rideable, the first thing we found was that there were quite a few discrepancies and we had to get out the ordnance survey map and the A to Z to find out where we were supposed to be, also fresh bits of track had been added and others were not really good to ride any more for various reasons. Anyway over several months Jean and I walked it and tweaked it till we thought we had a viable ride. Anyone who has done this ride knows that there are hills, hills and then more flippin’ hills! We were pretty fit by the time we had it sorted- lol! We ran it in 2015 and it went very well and everyone seemed to enjoy it but there were a couple of places that I wasn’t too happy with so I decided to box out on a regular basis and explore and try to find an alternative to one particular road that was quite fast and also had a farmers market with a large sign flapping about at the side of the road, I managed it but it did take a little bit off the distance but I thought it was worth it and that was how I intended leaving the ride but…When out exploring on foot at the start of this year Jean and I found another track which put a nice 3 mile loop onto the ride ! As most of you know we couldn’t run the ride last year as Jean was recovering from not only open heart surgery but a severe fungal infection which meant another major surgery afterward to try to get on top of it so we were pleased when Jean was up to putting it on this year. The day before the ride heavy rain was forecast so we decided to mark the bulk of it on the Friday and Sarah Bamber had walked the new loop with us a couple of weeks before and she said she would mark it herself on the Saturday but at the last minute my nerves got the better of me and I said I would go with her to make sure that we had it right, well the weather forecast was right and we were like drowned rats and we were praying that the markers didn’t get washed away ! The morning of the ride was dry but a bit cool and overcast but soon started to warm up and all of the riders went out without waterproofs which was nice to see after the foul weather the day before. We had 41 entries and every one turned up! It was lovely not to have any no shows. Everyone seemed to really enjoy the ride and I am pleased to say the markers stayed in place and no-one got lost; in fact we had comments about how well it was marked which made all the hard work worth-while. Medlock is a very varied ride with bits of everything and lots of hills with views to make them worth the climb! There are also some lovely sandy country park type tracks for some good canters on the way home...We will keep exploring and you never know next year, we may find another loop ( or 2 ) to add to it. Finally, I would like to thank all our helpers, without them our rides could not take place. Jenny. What a super day this was. Mark rode Ellie Puggles and I rode my Trojan Warrior Tommy Piglet. Both horses had ridden the day before at the Knott End Ride which was as usual brilliant and I always enjoy myself at that ride. So we decided to take it nice and steady as it was going to be hot. However, both horses were completely up for it and full of beans and really appeared to enjoy the varied terrain. The views were spectacular and even though the going in some parts quite challenging, there were some wonderfully inviting grassy slopes where we allowed our horses to have some beautiful rolling canters. I felt the horses dictated their own pace and proved to be nice and tentative walking down the slippery hills. The marking of the route was ace, the helpers at the check points etc were really friendly and the whole organisation was a credit to Sam and Jenny. Mark and I, Ellie and Tommy thoroughly enjoyed ourselves and returned all happy bunnies on a complete 'high' after a truly wonderful weekend’s riding. Pickup Bank Blast ride includes fabulous open views, a number of great canter opportunities and quiet country lanes. This year our event ran on Sunday 18th June - probably the hottest day of the year! Fortunately, hay-making was completed just in time to enable fun, fast tracks around our local fields. A water trough and rider treats were provided at the top of Pickup Bank and our thanks go to local residents whose help in providing water to passing riders and horses was hugely appreciated. Despite the heat, the route rode well, with lots of positive and helpful comments from participants, including barefoot horses. In response, we shall ensure that more water points are available next year with our superb marshalling team (thank you to our families and to Jackie, Carolyn and Maxine from Lancs. EGB) and are planning an additional mid-distance route of around 21km next year, to include more of the grassy tracks, whilst eliminating one of the hills. Thank you for the constructive feedback and praising reports through Survey Monkey, which will help us improve the ride further and make all the time spent organising entries and ensuring the route is clearly marked, safe and enjoyable worthwhile. This is a good fittening ride with varied terrain, in a dramatic location. It is such a pleasure to share the routes we enjoy around home with fellow endurance fans! Thank you from Sam Parkinson and Jenny Peacock for all of your help and continued support. We are looking forward to seeing new and returning riders next year. On July 1st, 21 members and 23 non-members set off to do the Dolphinholme ride . After a week of dubious weather, we were lucky the rain kept away on the day and the marking Linda and I had done stayed intact despite an odd shower! Although the farm ride is now officially closed, Mark allowed us to use some of his fields to give five miles of off road riding on the day and kindly cut some of his grass to give a trailer/car park on one of the fields. Riding through Nicky Nook valley is always a nice but challenging ride with some good hills and stony tracks, but the views from the fell road certainly make the climb worthwhile! On a good clear day, views range from Blackpool tower to Morecambe Bay, with the hills of the Lake District as a back drop. This year, Maxine Lang planned the route and took all riders up onto the fell road, with the longer route heading towards Barnacre church first, along super quiet lanes before turning back towards Fell End. The shorter route rode through Fell End Farm...a special concession to avoid two horrid gates, a marshy field and a nasty wooden bridge, before heading uphill on the Bridleway to the fell road. All the riders seemed to enjoy the ride and no one got lost along the way, which is always a bonus! All the drama was at the beginning of the ride with me managing to rip a tyre on the wagon, our starter Lynne broke down on her way to the venue, Sherene broke down on her way to a checkpoint and one rider arrived quite late due to a trailer tyre problem! Luckily, with the amazing help of Pauline, Sherene made it to the checkpoint and Beth our photographer found a good spot to take fabulous photos while Judy stood in for Lynne till she arrived...I think we call it team work...and that's one thing Lancashire group are fantastic at!!! All our four legged friends managed the route without major mishap and there were lots of smiling faces at the end of the ride. I would like to thank everyone who helped on the day; have mentioned a few names already but Cath helped with the parking and Maxine Braithwaite helped me at the secretaries desk due to Maxine Lang being unable to be there on the day, despite having done all the paperwork in advance. Judy and Arnold had the busiest spot being the main checkpoint where everyone went through twice! Thanks guys. Beth the photographer has images from the day to order on her website, justbephotography.co.uk, she did an amazing job and it’s great if we can support her by making some orders. A big thank you to everyone else who either came or helped, and apologies if I have missed anyone out. The weather was kind to us again at the Piethorne Valley ride. The day dawned bright and breezy; ideal weather for an adventure on the Pennines. There were 2 routes on offer this year, the usual route ridden slightly in reverse and a new loop to make a longer distance. Both routes although stony (due to being on the Pennines) rode quite well and without much mud, which is always a bonus. The longer route with a stony uphill section had mixed reviews, some enjoyed it and others didn’t. 37 riders booked on including 1 young rider and 12 non-members. A big thanks to the helpers on the day - Chris & Tania, Fran, Tracy, Kim, Jean, Steph, Sara, Claire, Maxine with the merchandise and a non-member Gillian, without your help these rides couldn’t run J. Thanks also to ride organiser Nicky and all the riders who came along to enjoy our wonderful scenery. I hope to see you all soon, have a fun filled and safe summer riding. Sun 9th April 2017 Croal Irwell Valley Pleasure Ride. Croal is a lovely ride and was blessed with great weather, a big thank you to Cath Houghton and her crew for doing a super job as usual of organising it. The week before the ride was very busy with people trying to get a place on what is proving to be a very popular ride on the calendar. Maxine Braithwaite did a fantastic job of taking entries and keeping everyone up to date with what was happening via Facebook and text. This year we decided to alter the route as the last stretch back to the venue is quite a busy road and a long drag with little variation, so I spent an afternoon driving round talking to land owners with no success, hence we used Langley Lane and the bridleway past the pig shed to return to the venue this year. The weather on the morning wasn’t fantastic but at least it wasn’t too windy and the rain held off. 61 riders set off from the venue Barton Equestrian Centre helped across the motorway bridges by Evelyn and Arnold when needed, to do either a 15 km or 24 km route. The bridleway just after the duck farm had eroded very badly so I got in touch with Lancashire County Council 2 months ago to explain our predicament of sending 60 riders along a path with a large hole in it......the fantastic result was that instead of just filling it in they put in a new drain on BOTH sides of the stream and cleared away a lot of overgrowth making it much more user friendly...a big thank you to Stephen Williams for his support. The marking proved to be spot on with only 2 riders getting slightly lost as they were discussing their Christmas dinner and went past the turning into the duck farm but then met up with Bec and Max who put them back on the route! Dave Gaskell had bought a new lens for the occasion and I am sure you will agree his photos are fabulous......look on his website davegaskellpictures.com to find yours! The last bridleway back to the venue got a bit deep and muddy but when you consider 120 horses had used it that day it held up reasonably well and was certainly a better option than using a busy-ish road. Sadly, despite a poster at the secretaries’ desk and Linda the starter asking people to keep off the verges, a couple of our riders churned up a lovely grass verge in Goosnargh village and two riders went so fast past cattle in an open building that they spooked them causing some of them to fall over.... it makes me wonder what happened to the un- written rule of walking past livestock and through private yards/property? Hopefully this totally selfish behaviour of members of Lancashire group will not jeopordise the running of this ride in future years. This ride report cannot be complete without a mention of our lovely Alice who baked some delicious cakes and biscuits raising almost £50 on the day for her chosen charity of the Blue Cross animal charity. Many thanks go to all our helpers on and before the day, without them giving up their time we wouldn’t be able to put a ride on at all and also to Barton equestrian for letting us take over their car park and supplying scrummy refreshments on the day. Hope to see you all again next year. RIDE REPORT FROM DOLPHINHOLME Sat 27th August 2016 . Lancs group EGB are supporting the Charity Echo in Africa charity which has been providing a screening programme for the occurrence of rheumatic heart disease in children from the townships of Cape Town.. These children do not have access to the medical facilities which you or I would expect and this screening programme may be the only means of their illness being detected. Further details of this charity can be accessed on the British Society of Echocardiography website. The Monday before the ride we were notified by the venue that unless the weather improved the ride would have to be cancelled due to ground conditions. So Janet and I spent the evening advising people by text, EGB website and Facebook that it was likely the ride would not happen. Then late Wednesday evening we were told the ride could go ahead after all though with some changes to the anticipated route. Friday saw Janet and I walking the lanes, fells and bridleways around the area marking routes ready for Saturday’s event and having last minute chats with the landowners whose land we were crossing before heading off to the Apple Store for a pretty late lunch. We were more than a little worried that the weather would break again and force the dreaded cancellation. On Saturday the weather was fantastic. Although the route had to be altered because of ground conditions and was boggy in some parts, the majority of the 49 riders seemed to really enjoy the day, especially the views across Morecambe Bay from above Fell End. Most of our riders were non-EGB members and they seemed to enjoy themselves tremendously, let’s hope they enjoyed it so much that they want to do it again and again. We would like to say thanks to all the riders who went carefully along the bridleway at Lane Head. As we discovered on Friday this actually passed through someone’s front garden, must remember that for next time. A few riders did seem to get lost here and there but everyone ultimately got back safe and sound to the venue. Perhaps we should’ve put more markers out but we assumed that because the route incorporated designated bridleways and was marked as such on the OS map and on posts it was obvious where the route lay. Obviously a case of assume nothing. Beth Eastham of JustBE photography was there on the day and took some super pictures. Please have a look at the ride photos on her website or via Facebook. Beth is also doing a write up about the ride which will be in Lancashire Life and will include some pictures of the event. Many thanks have to go to Helen aSunday 11th September 2016. Medlock Valley Pleasure Ridend Kenny at Swainshead Farm, Ayurveda Northern Approach for permitting access across their land for last Saturday (please note this part of the ride was only accessible for the day). Finally big Thanks to Dolphinholme Country Ride for allowing us to use their super facilities. Wardle Bridleways 30th Anniversary ride. Once again a big thank you to Sarah Bamber Nicky Clark and their helpers for the very well organised Wardle Bridleways Pleasure Ride, wonderfully marked a great fun day with yummy refreshments afterwards. A big thank you to Sarah Bamber Nicky Clark and all your helpers for the very well organised Piethorn Pleasure Ride, weather was good and the views and markings were fantastic. Marking the ride is not an easy task. Enjoying the ride is easy. A great day and the weather was good, thanks to Cath and Jamie Houghton for organising this ride. Its a great ride with little road one for the future. Photos will be available at www.whatapicture.biz. Please buy and not copy as Edwin supports us all the time. A big thanks to Sue and her helpers the weather was great and the ride went smoothly. lots of great grades. in it, open moors and long stony lanes, everyone seemed to enjoy it and asked if we was doing it again this year, two ladies traveled down from North Cumbria (over 2 hours) and where very happy and couldn't wait to come and do it again. we even had a trophy for the best turned out Elizabeth Nabb won it. Lovely ride great weather a big thanks to Glenda and helpers for a wonderful ride. Sunday turned out to be blue skies and sunny although there was a cool breeze, just right for riding. The day went well with lots of Grade ones. A massive thanks to all the Marshall's and Officials the rides would not go on without you.